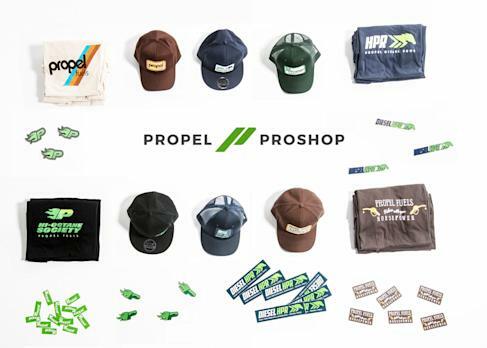 SACRAMENTO, CA --(Marketwired - August 24, 2016) - Propel Fuels, the nation's leading low-carbon fuel brand, announces the launch of the Propel ProShop (propelproshop.com), an online store for customers to purchase apparel and accessories. In addition to the ProShop, Propel has launched its Hi-Octane Society (Flex Fuel E85) and Diesel Pro (Renewable Diesel HPR) aficionado clubs, providing unique social forums for customers to share photos, videos and experiences about their use of high-performance, low-carbon fuels. "Propel is a totally customer focused company, and every single day we engage with drivers across California. Millennials make up our largest and fastest growing customer segment, our mobile apps have been a huge success and we launched the ProShop and social media channels to connect, energize and thank our core customers for their loyalty," said Rob Elam, CEO of Propel. "Propel's E85 and Diesel HPR are mainstream, affordable and very high performing fuels, which is why this generation is choosing them over the status quo of old, dirty petroleum." The Propel ProShop offers a variety of custom Propel hats, t-shirts, mugs, vehicle decals and chrome badges. Propel holds weekly ProShop branded apparel giveaway contests on social media (Facebook and Instagram), including the current "Relax With Your Horsepower" photo contest for fans to share a favorite summertime activity using Propel E85 or Diesel HPR on social media using the hashtag #RelaxWithYourHorsepower. "The Hi-Octane Society is a place where all types of people who use clean, high performance fuels to power their vehicles can come together and discuss their experience," said Gerrod Winkler, Hi-Octane Society member from Stockton, California. "E85 is the fuel of choice for performance drivers and the fuel of the future." This year Propel's Silicon Valley Workshop released a groundbreaking consumer study based on low-carbon fuel user behavior in California. The study found consumers are extremely loyal to low-carbon fuels, both Flex Fuel E85 and Diesel HPR. The user base for low-carbon fuels in California is extremely diverse, representing the broad based socio economic demographics of the state. Because today's low-carbon fuels are affordable to mainstream consumers and can run in a variety of vehicles, everyone can afford to use cleaner fuel options. Propel is the leading retailer of low-carbon fuels in America, with the highest volume locations and strongest brand loyalty in the industry. Propel operates retail stations across California, and provides commercial and bulk delivery for business and government fleets. Drivers can find the nearest Propel locations and fuel pricing by downloading Propel's mobile app, available in the Android and Apple app stores. A complete list of locations is available at propelfuels.com/locations. Propel was founded in 2004 with a mission to connect people to better fuels. With 34 Flex Fuel & 32 Diesel HPR locations across California, Propel provides new fuel choices that are higher in performance, deliver better value and create healthier communities. Propel also provides commercial and bulk availability for business and government fleets. Propel is ranked among 2015's top 10 private companies in Silicon Valley and is recognized by Inc. Magazine's "Inc. 500". More information is available at propelfuels.com and by following Propel at facebook.com/propelfuels and on Twitter at @PropelFuels. Locations and real time pricing can be found on Propel's mobile app.